Coalition negotiations are an important factor in the strategic voting calculations made by European electorates. Strategic voting, where voters give their support to a less favoured party in order to influence the result of an election, is a common feature of many democracies. Orit Kedar argues that while a great deal of work has been done to study the nature of strategic voting, it has generally focused exclusively on voter calculations about a party’s ability to win parliamentary seats. Calculations about coalition negotiations, such as voting for one half of a likely governing coalition, have mostly been overlooked; yet they may play a crucial role in determining how European electorates cast their vote. Although every voter in an election will have a candidate or a party which comes closest to matching their own preferences, other factors can influence the way citizens choose to vote. A common example is that if a voter’s preferred candidate has little hope of being elected to office, they may adopt a form of strategic voting and select an alternative candidate who stands more chance of success. This alternative candidate will not match their preferences quite so well, but they may be the best option out of those candidates who have a realistic chance of gaining power. In democracies which use a simple-majority, single vote system for elections, such as the ‘first past the post’ method typically used for national elections in the UK and the US, this effect is well established. Based on the work of Maurice Duverger, it is often formalised as part of ‘Duverger’s law’, which, put simply, states that voting procedures such as first past the post will tend to promote a system where two large parties primarily compete for power (such as Labour and the Conservatives in the UK). In addition to the psychological effect of voters supporting more successful candidates to avoid wasting their vote, there is also a mechanical effect in the sense that this form of voting tends to naturally skew the distribution of parliamentary seats in favour of larger parties. In democracies which use other forms of voting, such as proportional representation systems where a number of seats are contested in the same electoral district, the effect is less clear. Gary Cox has established the presence of strategic voting in proportional representation elections. The common wisdom, however, states that the incentives to use strategic voting will weaken as the number of seats per district rise. This is intuitive because when the number of seats reaches a certain level it should become difficult for voters to determine which parties are likely to be in contention for seats and which parties are unviable. Using data from the Comparative Study of Electoral Systems, I have examined this principle across seventeen elections in seventeen different countries. In each of the cases, respondents were asked to place themselves, as well as the main political parties in their country, on a general left-right ideology scale, which allows us to calculate the ideological distance between each voter and the available parties. Respondents also provided their vote choice, enabling us to examine the number of voters who chose to support the party closest to them ideologically. Figure 1 below illustrates the findings, with the proportion of voters supporting the party closest to them shown on the vertical axis and the average (median) number of seats contested per electoral district in each country shown on the horizontal axis. Note: Election years: Australia 2004, Belgium (Flanders) 1999, Britain 2005, Canada 2005, Denmark 2001, Finland 2003, Germany 2002, Iceland 2003, Ireland 2002, Israel 2006, Italy 2006, The Netherlands 2002, New Zealand 2002, Norway 2001, Portugal 2005, Sweden 2002, Switzerland 2003. Contrary to expectations, there is no systematic relationship between the number of seats contested per district and voters being drawn away from the party closest to them ideologically. 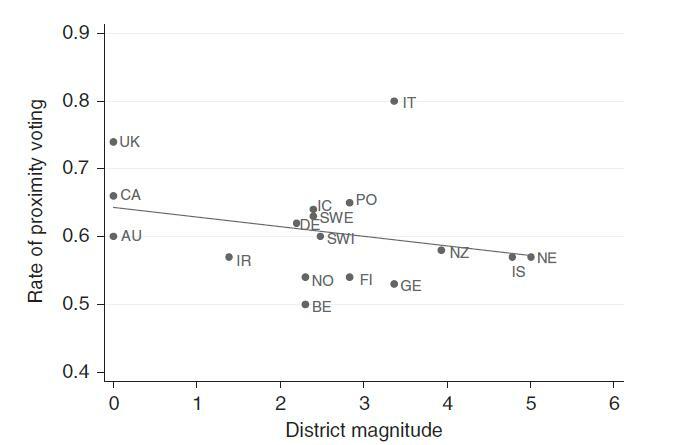 Indeed, some countries with single member districts, such as Canada and the UK, exhibit higher rates of ‘proximity voting’ than countries much higher on the district magnitude scale, such as Switzerland and the Netherlands. Obviously, in all systems included in the figure, voters have multiple allegiances, and various factors pull them in different directions. Religious affinities, class relations and ethnic identities all play a part in the voters’ choice. I do not presume to analyse all factors affecting voter choice in this study. Simply, the figure suggests that voters are pulled away from their ideologically preferred parties just as often in systems with a high number of seats per district, as they are in other systems. Although the graph shows little evidence for a link between strategic voting and district magnitude, it does not necessarily imply that the common approach is incorrect. Rather, it suggests that there may be other factors affecting the choices of voters. Political scientists have generally taken Duverger’s lead by focusing on the conversion of votes into seats and the desire to avoid a wasted vote for an unviable political party; however other stages of the electoral and post-electoral process exist and may be just as important in creating incentives for strategic voting. Where coalition negotiations take place, the process is detailed and nuanced, yet it can be generally described as consisting of at least four steps. First, votes are turned into legislative seats and a parliamentary party system emerges. Second, a formateur – the individual charged with negotiating a coalition – is selected by the head of state. Third, potential partners are approached and often a coalition is formed. Finally, portfolios are allocated to cabinet members. Once this process is completed, the formation of policy begins, involving different cabinet members, parliamentary committees and members of parliament from both the coalition and the opposition. Although in practice these steps may blend into each other, in terms of their effect on voters we can think of them as distinct. Each step, I argue, provides voters with different incentives to engage in strategic voting. Importantly, not all steps take place after all elections and in all countries: which steps are activated and which are muted depends on the institutional regime and election results. The first step of the process – translating votes into legislative seats – corresponds with the work of Duverger, as discussed above. In the second step, the formateur is usually, though not always, the head of the largest party in parliament. One can imagine voter choice taking into account this important step. For instance, voters may desert a favourite small party and instead support a larger party if they think the latter may become the largest or the one chosen to lead the government. Once the formateur is selected, meetings are held with leaders of various parties who attempt to form a governing coalition. Voters may engage in one of at least two strategies to affect the governing coalition. First, a voter may directly vote to affect the likelihood of a preferred coalition. Second, and perhaps more nuanced, is what Thomas Gschwend defines as a ‘coalition insurance strategy’. Under this strategy, voters support a small party, the potentially junior member of a preferred coalition, when they perceive this party to be in danger of falling below the electoral threshold necessary for gaining a parliamentary seat. In the final stage, where responsibilities are divided between coalition partners, a different incentive is available for voters. If voters expect a particular coalition to emerge from an election then they may withdraw their support from their support from their preferred party overall and vote for their preferred member of that coalition in order to increase the party’s bargaining power (and therefore ability to gain key government responsibilities) relative to the other members of the coalition. It is easy to see that various strategies can lead voters to support different parties. A left-leaning voter in a three-party system with parties Left, Centre and Right may support the Left party in an attempt to increase the likelihood of a Centre-Left coalition emerging or to affect the appointment of the formateur. Alternatively, suspecting that a Centre-Right government will emerge, a voter may choose to strengthen the Centre party in government and hence desert the Left party. Under the first past the post system, usually only the first stage of this process is likely to have relevance as the subsequent stages – selecting a formateur, forming a coalition and distributing government responsibilities – are often not applicable due to the likelihood of a single party gaining a majority. This is an important, but nonetheless only one, form of strategic voting. Under proportional representation with small district magnitudes this consideration is still activated, and as the magnitude increases it becomes less and less relevant. Similarly, as the likelihood of a multi-party government increases it is other considerations that are activated. In other words, every electoral system is likely to have some considerations activated and others not, depending on the potency of each of the four steps I have set out above. Parliamentary politics differs greatly across countries. In this article, I have reflected on the set of incentives posed to voters, and in particular on the ones posed by the formation of multi-party government. Putting potential strategies in a parliamentary framework enabled me to revisit our understanding of the familiar version of strategic voting and see it as a special case of an array of strategies, a case activated by the first of several post-electoral steps, the allocation of parliamentary seats. While political scientists have invested a great effort in understanding these steps in and of themselves, they have commonly focused on the single step crucial in ‘first past the post’ voting as informing, and indeed defining, the motivation of policy-minded voters. But barriers to attainment of a parliamentary seat are one in a set of parliamentary filters that make votes count (or not). Orit Kedar is an Associate Professor in the Department of Political Science at the Hebrew University of Jerusalem. Her principal research interest lies in comparative politics. In particular, she is interested in electoral politics, the intersection of behaviour and institutions, multi-level explanations in comparative politics, electoral systems, party systems, as well as questions of representation, federalism, identity, and European integration. Her latest book is Voting for Policy, Not Parties: How Voters Compensate for Power Sharing (2009, Cambridge University Press).